Every slots developer in the world seemingly has an online game designed to put its players in a much better mental head space. After all, how best to handle the outrageous swings that playing online slots can sometimes bring. Renowned online slots developer NextGen Gaming – the makers of such diverse slots like the Mafia comedy-fest, The Codfather, and the adventure-filled The Bermuda Mysteries – are the latest slots firm to add some zithers to their slots zing with a game filled with the beauty of Asia. You can tell straight off the bat that this is a slot that oozes beauty and the gameplay is not too bad either. 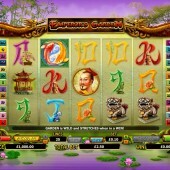 Like IGT’s Asian-themed slot, Water Dragons, with its plinky Asian music, lotus blossom and pastel colors, NextGen’s Emperor’s Garden plunges you into a similarly serene scenario. Stone Chinese lions, pagodas, bonsai trees, Koi fish, lotus-filled 10-through-Ace symbols and the Emperor himself fill out the reel spots in a 5 reel, 25 pay-line slot that has betting starting at just $0.01 a coin. The Wild symbol is the Garden icon, appearing on reels 2 to 4 only and substituting for all regular symbols on the reels other than the Koi Carp Scatter. Not only that, but the Garden Wild expands to fill the entire reel, giving you more chances to win. As with Water Dragons, the Koi carp swim about whenever they form a winning combo in a nice animated sequence, and dragonflies flutter gently on the side of the reels. The Koi fish themselves represent the Scatter. Hitting three or more Koi Carp wins you 10 free spins, and during the free spins round try and hit the Garden Wild as it triples all prizes. 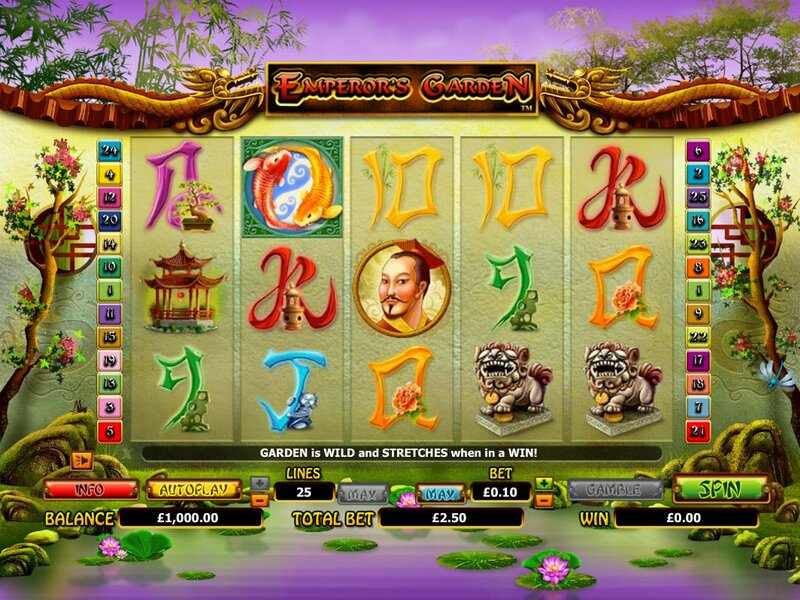 While a fairly basic free spins round doesn’t exactly set the world alight here, Expanding Wilds and Wilds that bump up the wins during the bonus round are the main draw in Emperor’s Garden. And with a potential jackpot of $10,000 up for grabs, those bonuses can really pay off in the long run.